The Heard Museum's permanent collections center on two areas: Southwestern Native cultures and contemporary Native art from across North America. In this way, the museum covers both the history of Native people in the Southwest and modern Native culture and experiences expressed through art. The Heard is well respected for it's sensitive and honest presentation of American Indian culture. They seem to strive to hire Native staff and trustees and to create real partnerships with tribes and artists in order to provide the most accurate representations. It's a place where Native people are telling a story about themselves. In addition to the art galleries, the museum complex includes beautiful outdoor spaces, an archival library, a restaurant, a coffee shop, two stores, and the American Indian Veterans National Memorial. The Heard Museum Shop has become a premier Native art dealer, and the museum also provides a book store, Books & More, which offers titles on American Indian and Southwestern art, history, cooking, travel, and children's books. You can shop online from their selections. The Courtyard Café serves Native/Southwest cuisine such as posolé, fresh-baked tortilla chips, and frybread with hummus made from tepary beans which are indigenous to Arizona. 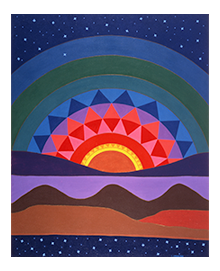 Linda Lomahaftewa (Hopi/Choctaw) “New Mexico Sunset” 1978. The Heard Museum hosts events, festivals, dance competitions, community and children's programming, online and video collections, auditorium and amphitheater performance spaces, and a children's courtyard play area. They are also home to the renowned Annual Heard Guild Indian Fair and Market in March. New York Times article from May 13, 1999, "Making Peace With Museums To Celebrate Their Culture; Phoenix Points the Way To Full Indian Collaboration."